We have discussed several aspects on Agile methodologies till now. 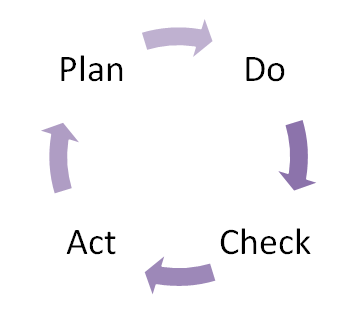 Let’s talk about What is PDCA? How does it help me? How can I use it? Company ABC Corporation decided to adopt Agile methodologies for their new project which is a Prepaid Phone Recharge Website. This will help end users to recharge their prepaid mobile phones using payment gateway implementation, provide offers to new users and offers/coupons on every transaction made by user. How PDCA help in this case? As a Product Owner of this company along with Scrum Master & Scrum Team we decided to deliver only MMF initially. So what we did is we created something called as PDP (Potentially Deliverable Product) and we released it to market. Don’t you have option of paying by Credit Card? When can I get option for prepaid recharge for IDEA, Tata Docomo (some other service providers)? Can you implement TV/DTH recharge option? Do you have an option of Postpaid bill payment? The discount coupons has got a validity of only 30 days, can it be increased? So this does not mean that our product implementation has failed. However, through this we got a great review and feedback from end users and then again we implemented some features step by step using iterative development and kept on releasing it to customers asking for their feeback every time. C – Check – We released it to market so that we get feedback from customer/end user. Next: Next post: What is MMF (Minimum Marketable Feature)?